If your LEGO collection is anything like mine then you probably have buckets of 4×2 bricks and an assortment of other 2 width bricks. My daughter and I were playing LEGOs the other day and we decided to try to build a house out of the red 2×4 bricks I have in my collection. As most LEGO projects go, the house evolved and turned into a barn. I didn’t have enough red bricks to make it all red so we made the loft area yellow. We choose blue for the roof to give it that Classic 1970s Legoland look. 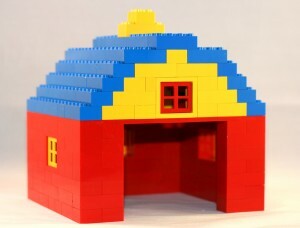 I have created some instructions in case anyone wants to make their own LEGO Classic Barn. The model has been added to Rebrickable.